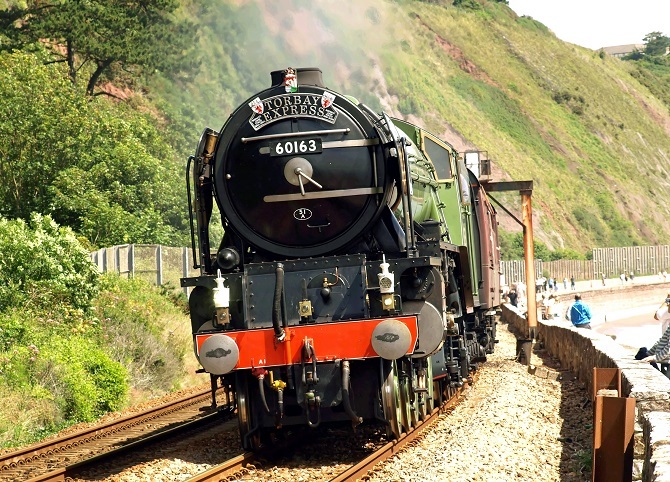 THE TORBAY EXPRESS steam-hauled train follows the route of Brunel’s picturesque Great Western Railway, speeding across the Somerset levels and around the beautiful Devon coastline on one of the most enchanting railway journeys in the world. You can choose to spend a break of up to five hours enjoying a relaxed time in the seaside resort of Paignton, where you can take a dip in the sea on the magnificent sea front; try the arcades or ice cream parlours. Remaining aboard will take you to our ultimate destination of Kingswear, where you can take the ferry across the River Dart to beautiful and historic Dartmouth (the ferry crossing is included in the ticket price). Local attractions at Dartmouth include the nearby National Trust properties of Greenway House (former home of Agatha Cristie) and Coleton Fishacre (the former country home of the D’Oyly Carte family), theBritannia Royal Naval College (giving an insight into the Royal Navy), Dartmouth Castle, cruises on the River Dart (including aboard paddle steamer Kingswear Castle* – the last remaining coal-fired paddle steamer in operation in the UK today, and of course the fashionable and fascinating waterside town of Dartmouth itself. Operating on summer Sundays THE TORBAY EXPRESS departs Bristol Temple Meads at approximately 09:15 on its scenic journey to the West and the spectacular coastal route to Torbay. Arrival back in Bristol is at about 20:10 (depending on the route). Historic steam locomotives which haul THE TORBAY EXPRESS include 5029 Nunney Castle, 4464 Bittern, 70000 Britannia (which hauled the Royal Train in 2012) and 34046 Braunton.